Abstract: Running on a single AAA battery the MSI MegaStick1 stores up to 128MB of data, allows you to listen to the radio when you run out MP3s, or even just to make a quick verbal note. The evolution of technology, isn't it a curious thing? To get to the MSI 5-in-1 Megastick 1 MP3 player we first have to look back, look way... back, to the time of the simple floppy disk. Storing 1.44MB of data it offered ease of use, low cost and broad compatibility. As file sizes bloated, the floppy gradually multiplied into 5 packs and then 20 packs. Pretty soon after the floppy became impractical as a portable, removable, and inexpensive storage solution. The ZIP drive gave us all a little breathing room, but like Iomega's stock price, never really rose, or gained widespread acceptance as did the humble 1.44MB floppy. There were brief flirtations with CDROMs, Superdisks, Jazz drives, and plenty of other mediums but nothing really dominated. Then USB, and the USB drive hit the marketplace. It was quick to use, inexpensive, driverless and able to store hundreds of MegaBytes of data. That was just the right equation to catch on. Fast forward past the whole Napster-MP3-Digital Music-RIAA debacle and the inundation of an army of shiny dedicated portable MP3 players, and the stage is set. 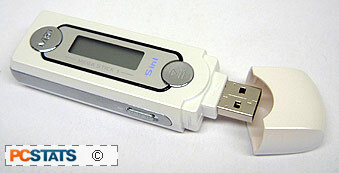 USB hard drives (solid state RAM with a USB jack sticking out one end) and portable MP3 players finally merged to form multi use digital appliances like the MSI 5-in-1 MegaStick1. After all, if you can store 128MB of data on the USB hard drive, why shouldn't you be able to use for music playback, or some voice recording? With built in memory (non-expandable) and full MP3 playback capability, other features thrown in for good measure are a digital FM radio, and voice recorder. All of this hangs from a decidedly un-Sony lanyard. But hey, you can't win them all right? One AAA battery, megastick, a USB-to-USB extension cable, headphones lanyard, pamplet, driver CDROM. Running on a single AAA battery (included) the MSI MegaStick1 stores up to 128MB of data, allows you to listen to the radio when you run out MP3s, or even just to make a quick verbal note. An electroluminescent backlight enables the LCD to be seen even in the dark, and a Jog-dial helps with file navigation. The controls are moderately good, but the LCD text a little too small, and the menu navigation somewhat unintuitive. Overcome those minor hurdles and you have a pretty neat little unit that even James Bond would use. Pg 4. Does the MegaStick Sink or swim?